Biomind was developed in a joint venture between a Singaporean tech company, Hanalytics, and China’s prestigious Tiantan Hospital. 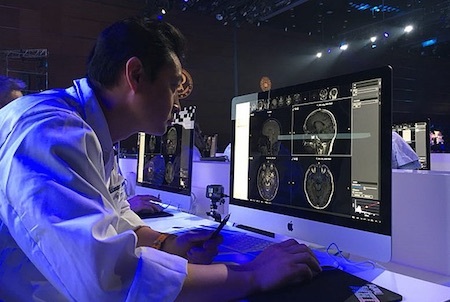 Tens of thousands of carefully curated medical images were used to train Biomind, which was then pitted against 25 experienced doctors at Beijing’s China National Convention Center testing their ability to analyze images of the brain. The AI competition had the glitz and drama of a TV game show, with flashing lights, heroic music and a glamorous presenter wearing a filmy white miniskirt and one dangly gold earring. Dr. Lin Yi who participated and lost in the second round, said that she welcomes AI, as it is not a threat but a "friend." 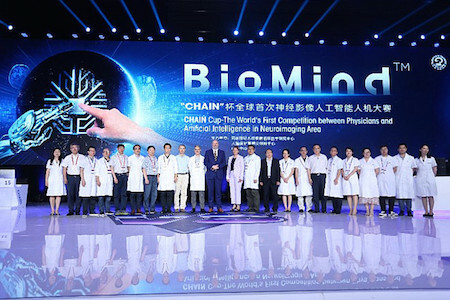 Bian Xiuwu, an academician with the Chinese Academy of Science and a member of the competition's jury, said there has never been an absolute standard correct answer in diagnosing developing diseases, and the AI would only serve as an assistant to doctors in giving preliminary results. Science fiction fans eagerly await our artificially intelligent doctors and their human helpers/masters. Consider the autodoc from Larry Niven's 1970 novel Ringworld, which treats patients as well as examining and diagnosing their illnesses, and the electronic body analyzer from Michael Crichton's 1969 novel The Andromeda Strain, which does a pretty good job with a physical exam.